Today we complete the catechesis on the fifth question of the "Our Father", dwelling on the expression "as we also forgive our debtors" (Mt 6:12). We have seen that it is proper to man to be a debtor before God: from Him we have received everything, in terms of nature and grace. Our life was not only wanted, but loved by God. There really is no room for presumption when we join hands to pray. There are no "self made man" in the Church, men who have made themselves. We are all indebted to God and to many people who have given us favorable living conditions. Our identity is built starting from the good received. The first is life. Those who pray learn to say "thank you". And we often forget to say "thank you", we are selfish. Those who pray learn to say "thank you" and ask God to be kind to him or her. However much we strive, there is always an unbridgeable debt before God, which we will never be able to repay: He loves us infinitely more than we love him. And then, as much as we commit ourselves to live according to Christian teachings, in our lives there will always be something to ask forgiveness for: let's think about the days passed lazily, the moments when the grudge has occupied our heart and so on. It is these experiences, unfortunately not rare, that make us implore: "Lord, Father, forgive us our debts". We thus ask forgiveness from God. Come to think of it, the invocation could also be limited to this first part; it would have been beautiful. Instead, Jesus welds it with a second expression that is one with the first. The relationship of vertical benevolence on the part of God is refracted and is called to translate itself into a new relationship that we live with our brothers: a horizontal relationship. The good God invites us to be all good. The two parts of the invocation are tied together with a merciless conjunction: we ask the Lord to forgive our debts, our sins, "like" we forgive our friends, the people who live with us, our neighbors, the people who he did something not nice about it. Every Christian knows that for him the forgiveness of sins exists, we all know this: God forgives everything and always forgives. When Jesus tells his disciples the face of God, he outlines it with expressions of tender mercy. He says that there is more joy in heaven for a sinner who repents, rather than for a crowd of righteous people who do not need conversion (see Lk 15.7.10). Nothing in the Gospels suggests that God does not forgive the sins of those who are well disposed and asks to be re-embraced. But the abundant grace of God is always challenging. Those who have received so much must learn to give so much and not hold back only what they received. Those who have received so much must learn to give so much. It is no coincidence that the Gospel of Matthew, immediately after giving the text of the "Our Father", among the seven expressions used, suffers to emphasize precisely that of fraternal forgiveness: "If you in fact forgive others for their faults, the Father your who is in heaven will also forgive you; but if you do not forgive others, neither will your Father forgive your faults "(Mt 6,14-15). But this is strong! I think: sometimes I heard people say: "I will never forgive that person! I will never forgive what they did to me! " But if you do not forgive, God will not forgive you. You close the door. We think, we are able to forgive or if we do not forgive. A priest, when I was in the other diocese, told me anguished that he had gone to give the last sacraments to an old woman who was on the point of death. The poor lady could not speak. And the priest says to her: "Madam, do you repent of sins?" The lady said yes; he could not confess them but he said yes. It's enough. And then again: "Do you forgive others?" And the lady, on her deathbed said: "No". The priest remained distressed. If you do not forgive, God will not forgive you. We think, we who are here, if we forgive or are able to forgive. "Father, I can't do it, because those people made me so many." But if you can't do it, ask the Lord to give you the strength to do it: Lord, help me to forgive. Here we find the bond between love for God and love of neighbor. Love calls love, forgiveness calls forgiveness. Again in Matthew we find a very intense parable dedicated to fraternal forgiveness (see 18,21-35). Let's listen. There was a servant who had a huge debt with his king: ten thousand talents! An impossible sum to repay; I don't know how much it would be today, but hundreds of millions. But the miracle happens, and that servant receives not a payment extension, but the full amnesty. An unexpected grace! But here it is that very servant, immediately afterwards, rages against his brother who owes him a hundred denari - small thing -, and, although this is an accessible figure, it does not accept excuses or supplications. Therefore, in the end, the master calls him back and has him condemned. Because if you don't try to forgive, you won't be forgiven; if you do not try to love, you will not be loved either. Jesus inserts the power of forgiveness into human relationships. In life, not everything is resolved with justice. No. Especially where we must put a barrier to evil, someone must love beyond the necessary, to start a story of grace again. Evil knows its revenge, and if it is not interrupted it risks spreading and suffocating the whole world. To the law of retaliation - what you did to me, I give it back to you, Jesus replaces the law of love: what God has done to me, I give it back to you! Let us think today, in this very beautiful Easter week, if I am able to forgive. And if I don't feel capable, I have to ask the Lord to give me the grace to forgive, because knowing how to forgive is a grace. God gives every Christian the grace to write a story of good in the lives of his brothers, especially those who have done something unpleasant and wrong. With a word, a hug, a smile, we can convey to others what we have received most precious. What is the precious thing we have received? Forgiveness, which we must be able to give to others. Je salue cordialement les pèlerins venant de France et de Suisse, en particulier les jeunes de Guyane française, et les Guides du Liban ! En ce temps où nous célébrons la Résurrection du Seigneur, n’ayez pas peur de manifester que Jésus est vivant, qu’il est votre vie ! Bonnes fêtes pascales à tous et que Dieu vous bénisse. I greet the English-speaking pilgrims and visitors taking part in today’s Audience, especially those from the United Kingdom, Ireland, Finland, the Netherlands, Sweden, Australia, New Zealand, Hong Kong, Indonesia, Malaysia, the Philippines, Singapore and the United States of America. In the joy of the Risen Christ, I invoke upon you and your families the loving mercy of God our Father. May the Lord bless you all! Herzlich heiße ich die Brüder und Schwestern deutscher Sprache willkommen. Ich freue mich, die vielen jungen Menschen zu begrüßen, besonders die Firmlinge und Ministranten. Christus lebt! Mit seiner Auferstehung hat der Herr die Sünde und den Tod überwunden. Der Auferstandene erneuere unser Leben und mache uns fähig, die Kraft der Liebe und Vergebung unseren Nächsten zu schenken. Gesegnete Ostern! Saludo cordialmente a los peregrinos de lengua española venidos de España y Latinoamérica, en modo particular saludo a los alumnos del Seminario Menor de Tui-Vigo, en su 60 aniversario de fundación, acompañados por su Obispo, Mons. Luis Quinteiro Fiuza. Pidamos al Señor que nos dé la gracia de saber escribir una historia de bien en la vida de nuestros hermanos y de transmitirles con gestos de ternura la experiencia del perdón gratuito que Él nos ha dado. ¡Feliz Pascua de Resurrección! Que Dios los bendiga. De coração saúdo todos os peregrinos de língua portuguesa, com menção particular dos fiéis de Ramalhão, Alvorminha, Vidais e Salvador da Bahia. A Virgem Maria, que permaneceu ao pé da cruz de Jesus, amando até ao fim, para depois ser inundada de alegria infinita com a ressurreição do seu Filho, nos ensina que o amor faz a Páscoa: quem ama passa da morte à vida. A todos vós e aos vossos entes queridos, desejo uma santa Páscoa! أرحب بالحاضرين الناطقين باللغة العربية، وخاصة بالقادمين من مصر، ومن الشرق الأوسط. إن "أغفر لنا ... كما نغفر نحن" هو ذروة الصلاة الربية، كما يعلمنا القديس يوحنا ذهبي الفم، أن: "دينونتنا تعتمد علينا"، أي أننا سنحصل في المقابل على ما قدمناه نحن للآخرين. ليبارككم الرب جميعا ويحرسكم دائما من الشرير! I affectionately greet the Italian-speaking pilgrims. In particular, I welcome the preadolescents of Milan, accompanied by their Archbishop, Monsignor Mario Delpini, and their priests and educators. Dear children, I encourage you to grow in faith and charity, committing yourselves to bear good fruit. May the Gospel be your rule of life, as it was for your saints: Ambrose and Charles, who with their love changed their world. I address a special thought to the confirmed candidates of the Diocese of Treviso, gathered here with their Pastor, Monsignor Gianfranco Gardin; with the power of the Holy Spirit, be generous witnesses of Christ. 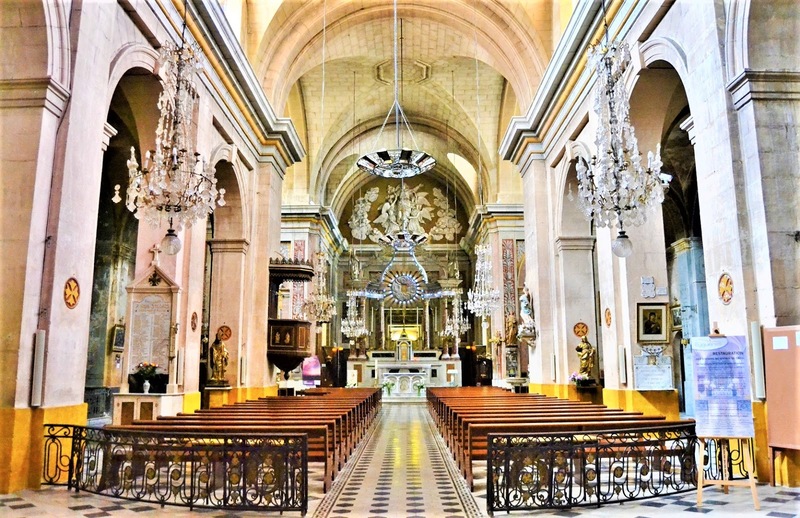 I greet the faithful of the oratories and parishes, especially those of Lecce, Cava dei Tirreni and Magione; the new Deacons of the Society of Jesus, with their families; the Religious and Religious; educational institutions and associations, in particular the Città della Speranza Foundation, of Monte di Malo. A thought I address to the young, the elderly, the sick and newlyweds. For all I invoke the joy and hope that come from the Easter of Christ. May you experience the living Jesus, to welcome the gift of his peace and become his witnesses in the world. The Homily of the Easter Mass in Paris. 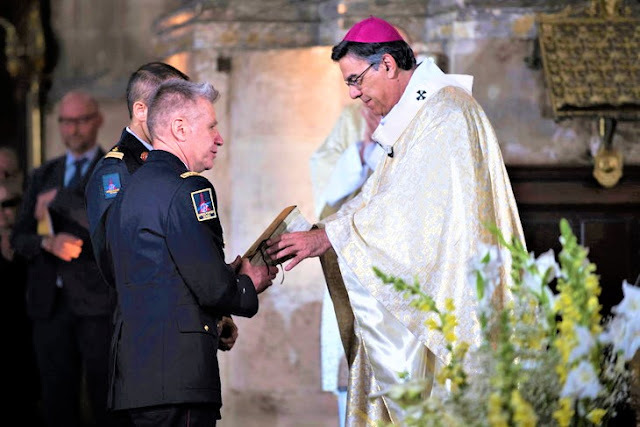 After the fire of Notre-Dame, Mass was held in the church St Eustache which welcomed Archbishop Mgr Michel Aupetit. Thousands of faithful flocked to attend Mass.Saint Eustatius on Easter Sunday 21 April 2019. "We removed the Lord from his tomb and we do not know where it was deposited" is the breathless testimony of Mary Magdalene to the two apostles Peter and John. Where is the body of the Lord? This is the question that arose Monday evening at the height of the fire of Notre-Dame de Paris: "Where is the body of the Lord"? It was necessary to save the cathedral, the treasure, made up of goldsmith's pieces accumulated over the centuries. It was also necessary to save, for the believers, this infinitely precious relic: the crown of thorns of Jesus brought back by King Saint-Louis. But an agonizing question arose in my heart: "Where is the body of the Lord"? 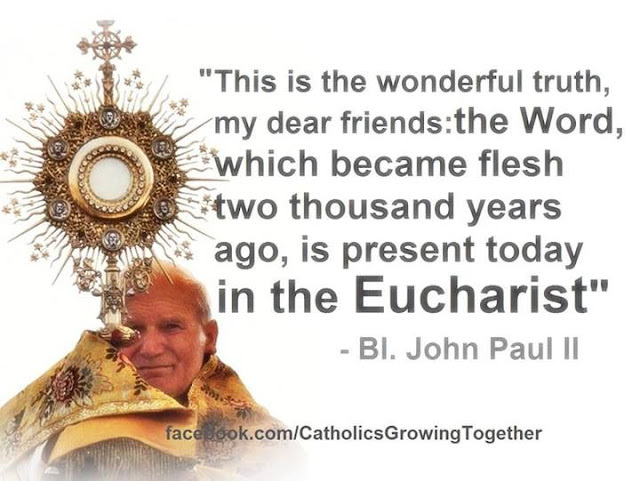 Was it possible to leave the Blessed Sacrament? The body of Jesus who was in the tabernacle? It is for this body, veiled under the appearance of a crumb of bread that was built this cathedral. What is most valuable? The cathedral, the treasure or the crumb of bread? The crumb of bread is the Body of God, the Body of Christ, his Risen Body, elusive unless he gives himself. And he gives himself: "My life no one takes it, it's me who gives it". And then what we celebrated on Holy Thursday: "Take, eat, this is my Body". This crumb of bread is the Life of God that communicates itself. This crumb of bread gives to those who receive it eternal life, it opens us the gates of Heaven, it makes us participate in the resurrection of Christ, this resurrection that we are celebrating today and which will call our own resurrection in the flesh. return from the Lord as we wait for the completion of time. We want to save the cathedral. This splendid jewel was intended to be the magnificent manifestation of human genius that pays tribute to the love of a God who gives himself out of love and who, to give himself, became one of us. Let us pay homage to the faith of the builders who have united human genius and divine grace. Today we pay tribute to our dear firefighters who, too, have shown their know-how, their courage, and we thank them for having been able to preserve the essential, sometimes at the risk of their life. When the prayer of the whole people of God joined your courage and professionalism, everything was still possible. And that was possible. Thank you really on behalf of all. But I would also like to thank the fire chaplain, Father Fournier who went to get the Body of Christ, the Blessed Sacrament, this crumb of bread that gives full meaning to the life of this splendid building. He also took risks to save a crumb of bread because it was the resurrected Body of our Lord that we are celebrating today, as we celebrate every Sunday, which has become the central day of our week because it is is the day of his resurrection. The apostles rushed to the tomb of Christ, they did not find his body, they believed. We found the resurrected body of the Lord. We, too, believe. 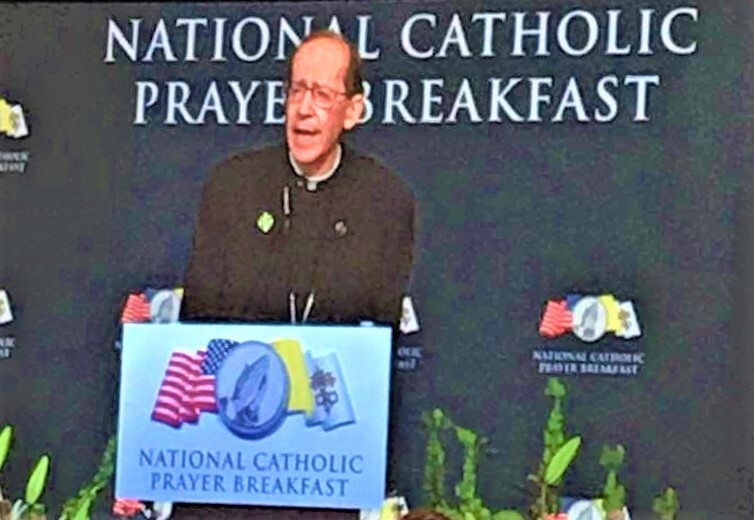 The annual National Catholic Prayer Breakfast took place at the Marriott Marquis hotel in Washington April 23, 2019. There were 1,400 people who attended. The breakfast was established in 2004, in answer to St. John Paul’s call for a new evangelization. George W. Bush addressed the gathering, from 2005 to 2008. Vice President Mike Pence addressed the breakfast in 2017. This year's speakers were Sister Bethany Madonna, vocations director of the Sisters of Life, and Curtis Martin, the founder and CEO of the Fellowship of Catholic University Students. Mick Mulvaney, the acting White House chief of staff and director of the Office of Management and Budget, spoke about President Donald Trump's commitment to religious liberty. The main guest speaker was the Most Reverend Thomas J. Olmsted, Bishop of the Diocese of Phoenix. Olmsted is also a consultant to the pro-life committee of the U.S. Conference of Catholic Bishops. "Faith in the crucified and risen Christ shields us from two cold and deadly sins: arrogant presumption and cynical despair," said Bishop Thomas J. Olmsted of Phoenix, the guest speaker. "Neither of which are appropriate in a Christian leader. The enemy of our souls does not care which we prefer." "It is my pastoral duty to proclaim the Gospel of life and the protection in law of the most vulnerable among us. The love of Christ compels me." Bishop Olmsted also recalled the words of St. John Paul II at a Mass on the National Mall in October 1979: "We will stand up and proclaim that no one ever has the authority to destroy unborn life." 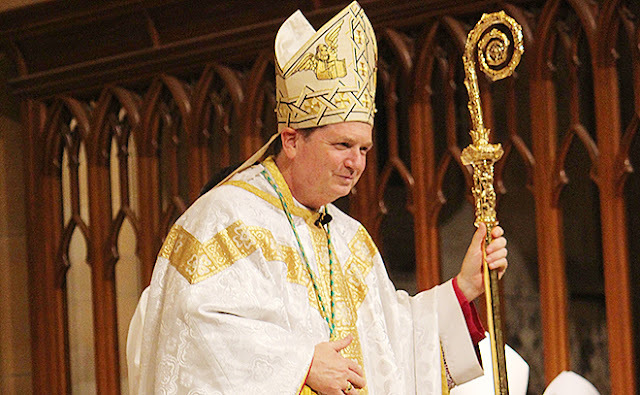 Speaking of the Born-Alive Abortion Survivors Protection Act, recently blocked by House Democrats, Bishop Olmsted asked, "Where does blatant disregard for a child's life come from? From hardened hearts. A child demands love, and love costs." "Any rejection of bodiliness," he added, "will immediately target two beautiful but demanding and sometimes inconvenient realities: marriage and the human child." Marriage, he said, "stands now in the way of the gender ideology. We Christians will stand for the reality of marriage today in our homes and the public square, even when facing persecution today." A rapidly lowering birth rate in the United States, he said, means that the warning about contraception in St. Paul VI's 1968 encyclical, "Humanae Vitae," has come true, and "the disaster invited by theologians, bishops, priests and laity who protested Paul VI's prophetic letter is upon us," with sexual pleasure separated from procreation. "Enough!" "Christians are called not to complacency, but to greatness, to have hearts great enough to be filled with God," Bishop Olmsted concluded. "The president has allowed us Christians, of all denominations, to be very vocal about their faith and to prioritize our faith," he said. "Over the past two-and-a-half years, I think you can see the principles of our faith being manifested." Trump has addressed the annual March for Life rally via a video hookup the past two years. "I can assure you," Mulvaney added, that he has sat in the Oval Office many times when Trump has admonished foreign leaders and diplomats in saying, "You're not doing enough to take care of the Christians in your country," or has praised them with "thank you for taking care of the Christians in your country." "I won't lie to you, that that's pretty powerful stuff. To be able to be there, to be part of that, has been very invigorating," said Mulvaney, a member of Opus Dei and a graduate of Georgetown University. "I'm comfortable as a Catholic, even though I'm working for a president who is not Catholic, that the principles of our faith are alive and well and well respected in this administration and driving many of our policies," he added. The 1,400 attendees gave a standing ovation to Ted and Julie Sandmann, parents of Nick Sandmann, the Covington (Kentucky) Catholic High School student who was thrown into the center of a national spotlight in January when videos of him and his classmates interacting with Native Americans and others near Washington's Lincoln Memorial went viral. Abby Johnson also received an ovation, she is the pro-life activist who runs And Then There Were None, a ministry to former abortion clinic workers, who was recently portrayed in the film drama "Unplanned," which proved to be successful at the box office. "The critics, they thought we'd make 40 bucks, and we're sitting on $17 million right now," she said. The film, which cost $6 million to make, is her story as a former director of a Planned Parenthood clinic who eventually rejected abortion to join the pro-life movement. "I'm waking up every day getting emails from people; who told me they walked into the film pro-choice and walked out pro-life. This is why we decided to do ‘Unplanned' -- for the conversion of hearts." for the three o’clock hour of prayer. to beg for alms from the people who entered the temple. He paid attention to them, expecting to receive something from them. and immediately his feet and ankles grew strong. walking and jumping and praising God. at what had happened to him. R.(3b) Rejoice, O hearts that seek the Lord. make known among the nations his deeds. proclaim all his wondrous deeds. R. Rejoice, O hearts that seek the Lord. rejoice, O hearts that seek the LORD! seek to serve him constantly. sons of Jacob, his chosen ones! throughout the earth his judgments prevail. and by his oath to Isaac. and they were conversing about all the things that had occurred. but their eyes were prevented from recognizing him. to a sentence of death and crucified him. it is now the third day since this took place. who announced that he was alive. And he said to them, “Oh, how foolish you are! How slow of heart to believe all that the prophets spoke! he gave the impression that he was going on farther. So he went in to stay with them. broke it, and gave it to them. but he vanished from their sight. and how he was made known to them in the breaking of the bread. 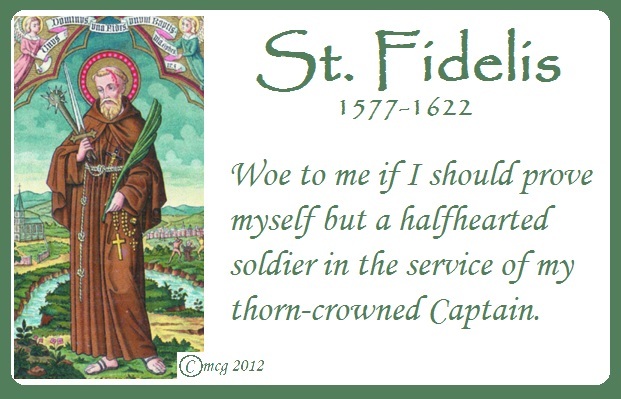 PRAYER: Father, you filled Saint Fidelis with the fire of your love and gave him the privilege of dying that the faith might live. Let his prayers keep us firmly grounded in your love, and help us to come to know the power of Christ’s resurrection. Through Jesus Christ, your Son, who lives and reigns with you in the unity of the Holy Spirit, one God, for ever and ever. Amen. He was born in 1577, at Sigmarengen, a town in Germany, in the principality of Hoinvenzollen. The name of his father was John Rey. The saint was christened Mark, performed his studies in the university of Fribourg in Switzerland, and while he taught philosophy, commenced doctor of laws. He at that time never drank wine, and wore a hair-shirt. His modesty, meekness, chastity, and all other virtues, charmed all that had the happiness of his acquaintance. In 1604, he accompanied three young gentlemen of that country on their travels through the principal parts of Europe. During six years, which he continued in this employment, he never ceased to instil into them the most heroic and tender sentiments of piety. He received the holy sacrament very frequently, particularly on all the principal holidays: in every town where he came, he visited the hospitals and churches, passed several hours on his knees in the presence of the blessed sacrament, and gave to the poor sometimes the very clothes off his back. After this he practiced the law in quality of counsellor or advocate, at Colmar, in Alsace, with great reputation, but with greater virtue. Justice and religion directed all his actions. He scrupulously forbore all invectives, detractions, and whatever might affect the reputation of any adversary. His charity procured him the surname of counsellor and advocate for the poor: but the injustices of a colleague in protracting lawsuits for gain, and his finding fault with our saint for producing all his proofs for his clients in the beginning, in order to the quicker dispatch, gave him a disgust of a profession which was to many an occasion of sin, and determined him to enter among the Capuchin friars. He first received holy orders, and having said his first mass in their convent at Fribourg, on the feast of St. Francis, in 1612, he consecrated himself to God by taking the habit. The guardian gave him, in religion, the name of Fidelis, or Faithful, alluding to that text of the Apocalypse which promises a crown of life to him who shall continue faithful to the end. From that moment humiliations, macerations, and implicit obedience were his delight. He overcame temptations by discovering them to his director, and submitting to his advice with regard to his conduct under them. By his last will, he bequeathed his patrimony to the bishop's seminary, for the establishment of a fund for the support of poor students, to whom he also left his library; and gave the remainder of his substance to the poor. In regard to dress and furniture, he always chose that for his own use which was the least valuable and convenient. He fasted Advent, Lent, and Vigils, on bread and water, with dried fruits, tasting nothing which had been dressed by fire. His life was a continued prayer and recollection, and at his devotions he seemed rather like an angel than a man. His earnest and perpetual petition to God was, that he would always preserve him from sin, and from falling into tepidity or sloth in his service. He sought the most abject and most painful employments even when superior; knowing that God exalts those highest who have here humbled themselves the lowest and the nearest to their own nothingness. He had no sooner finished his course of theology, than he was employed in preaching and in hearing confessions; and being sent superior to the convent of Weltkirchen, that town and many neighboring places were totally reformed by his zealous labors, and several Calvinists converted. The congregation de propaganda fide, sent to father Fidelis a commission to go and preach among the Grisons; and he was the first missionary that was sent into those parts after that people had embraced Calvinism. Eight other fathers of his order were his assistants, and labored in this mission under his direction. The Calvinists of that territory, being incensed at his attempt, loudly threatened his life, and he prepared himself for martyrdom on entering upon this new harvest. Ralph de Salis, and another Calvinist gentleman, were converted by his first conferences. The missionary penetrated into Pretigout, a small district of the Grisons, in 1622, on the feast of the Epiphany, and gained every day new conquests to Christ; the conversion of which souls ought to be regarded as more the fruit of the ardent prayers in which he passed great part of the nights, than of his sermons and conferences in the day. These wonderful effects of his apostolic zeal, whereof the bishop of Coire sent a large and full account to the congregation de propaganda, so enraged the Calvinists in that province, who had lately rebelled against the emperor. their sovereign, that they were determined to bear with them no longer. 'The holy father having notice of it, thought of nothing but preparing himself for his conflict, passing whole nights in fervent prayer before the blessed sacrament, or before his crucifix, and often prostrate on the ground. On the 24th of April, 1622, he made his confession to his companion with great compunction, said mass, and then preached at Gruch, a considerable borough. At the end of his sermon, which he delivered with more than ordinary fire, he stood silent on a sudden, with his eyes fixed on heaven, in an ecstasy, during some time. He foretold his death to several persons in the clearest terms, and subscribed his last letters in this manner: "Brother Fidelis, who will be shortly the food of worms." From Gruch he went to preach at Sevis, where, with great energy, he exhorted the Catholics to constancy in the faith. A Calvinist having discharged his musket at him in the church, the Catholics entreated him to leave the place. He answered, that death was his gain and his joy, and that he was ready to lay down his life in God's cause. On his road back to Gruch, he met twenty Calvinist soldiers with a minister at their head. They called him false prophet, and urged him to embrace their sect. He answered: "I am sent to you to confute, not to embrace your heresy. The Catholic religion is the faith of all ages, I fear not death." One of them beat him down to the ground by a stroke on the head with his backsword. The martyr rose again on his knees, and stretching out his arms in the form of a cross, said with a feeble voice "Pardon my enemies, O Lord: blinded by passion they know not what they do. Lord Jesus, have pity on me. Mary, mother of Jesus, assist me." Another stroke clove his skull, and he fell to the ground and lay wetering in his blood. The soldiers, not content with this, added many stabs in his body, and hacked his left leg, as they said, to punish him for his many journeys into those parts to preach to them. A Catholic woman lay concealed near the place during this butchery; and after the soldiers were gone, coming out to see the effects of it, found the martyr's eyes open, and fixed on the heavens. He died in 1622, the forty-fifth year of his age, and the tenth of his religious profession. He was buried by the Catholics the next day. The rebels were soon after defeated by the imperialists, an event which the martyr had foretold them. The minister was converted by this circumstance, and made a public abjuration of his heresy. After six months, the martyr's body was found incorrupt, but the head and left arm separate from the trunk. These being put into two cases, were translated from thence to the cathedral of Coire, at the earnest suit of the bishop, and laid under the high altar with great pomp; the remainder of the corpse was deposited in the Capuchin's church at Weltkirchen. Three miracles performed by his relics and intercession, out of three hundred and five produced, are inserted in the decree of his beatification, published by pope Benedict XIII., in 1729. Other miracles were proved, and the decree of his canonization was published by Benedict XIV., in 1746. The 24th of April is appointed the day of his festival, and his name is inserted in the Roman Martyrology. See the acts of his canonization: also his life, written by Dom. Placid, abbot of Weissenau, or Augia Brigantina, published by Dom. Bernard Pez, librarian in the famous abbey of Melch, in Austria, in his Bibliotheca Ascetica, t. 10, p. 403. To contribute to the conversion of a soul from sin is something far more excellent than to raise a dead body to life. This must soon fall again a prey to death; and only recovers by such a miracle the enjoyment of the frail and empty goods of this world. But the soul which, from the death of sin, is raised to the life of grace, is immortal, and, from a slave of the devil and a firebrand of hell, passes to the inestimable dignity and privileges of a child of' God; by which divine adoption she is rescued out of the abyss of infinite misery, and exalted to the most sublime state of glory and happiness, in which all the treasures of grace and of heaven are her portion forever. Hunger, thirst, watchings, labors, and a thousand martyrdoms, ought to seem nothing to one employed in the sacred ministry, with the hopes of gaining but one sinner to Christ. Moreover, God himself will be his recompense, who is witness, and keeps a faithful account of all his fatigues and least sufferings. 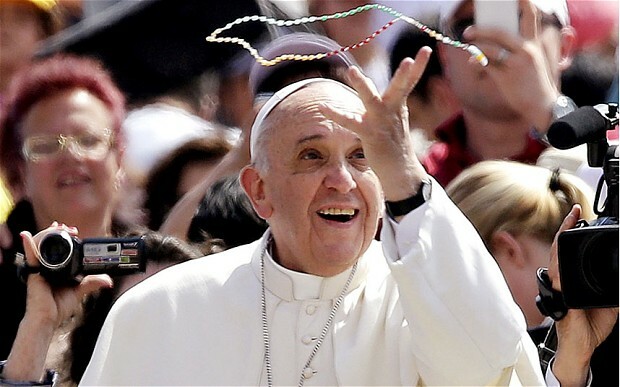 On his Name Day, Pope Francis donated — through the Office of Papal Charities — six thousand Rosaries from World Youth Day to young people from the Archdiocese of Milan. The youth were taking part in a Mass celebrated in St Peter’s Basilica on Tuesday by Milan’s Archbishop, Mario Delpini. Pope Francis, baptized Jorge (George) Mario Bergoglio, celebrates his Name Day on April 23, the feast of St George the Martyr. It is traditional in some parts of the world for people to celebrate in a special way the feasts of the saints for whom they are named. The Rosaries donated to the young pilgrims were made with olive wood from the Holy Land specifically for the most recent World Youth Day, which took place in Panama in January; and for Youth Day at the Diocesan level on Palm Sunday. Caritas Jerusalem organized the production of the Rosaries, which gave work to the poor, to refugees, and to families of prisoners. On Wednesday morning, the young people from Milan — who are participating in the Archdiocesan pastoral year dedicated to the theme, “They go from strength to strength” (“Cresce lungo il cammino il suo vigore”, Ps 84:8) — will be present for the General Audience with Pope Francis. In a note, the Director ad interim of the Holy See Press Office, Alessandro Gisotti said that, “accompanying [the Pope’s] gesture, the Holy Father asked the young people to remember him in a special way in their prayer, particularly by entrusting him to the Virgin Mary just a few days before the month of May” which is dedicated to the Mother of God. The bombings in Sri Lanka on Easter Sunday 2019 have claimed 321 lives. A report has indicated that the terrorist group ISIS has claimed responsibility in retaliation for the attack against a mosque in New Zealand. 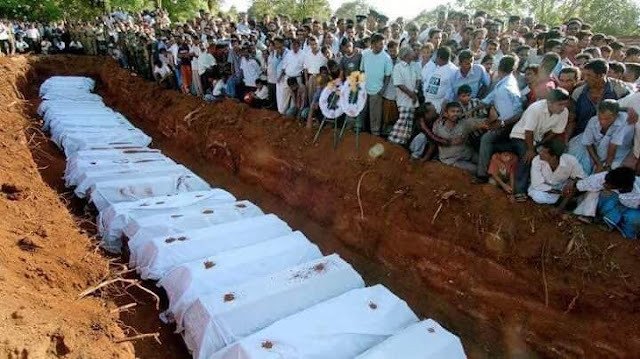 The country of Sri Lanka held a national day of mourning with the first set of burials taking place. A moment of silence and memorial services took place on Tuesday, April 23, 2019. The Islamic State (ISIS) used it's Amaq news agency to report its claim. The Sri Lankan prime minister, Ranil Wickremesinghe, said all those arrested (40 people) so far are Sri Lankan nationals. The death toll climbed to 321 people with 500 injured– including 38 foreigners. An relative of the Bangladeshi prime minister is among the 45 children that died in the attack. All over the world flags were flown at half mast in honour of Sri Lanka victims. The lights of the Eiffel Tower, in France, were dimmed as a mark of respect to victims. On Easter Sunday afternoon another fire was intentionally set in a beautiful historic Catholic church in France. Police confirmed that the fire in Notre-Dame de Grâce Church appears to have been intentionally set. The fire was started in a large, wooden confessional in the town of Eyguières, in southern France. “Flames several meters high were coming out of the church,” according to mayor Henri Pons. There is much damage including an area of some 20 square meters in the church which was destroyed. However, Joel Jouve, who lives near the church “used fire extinguishers from the village movie theater and courageously entered the church while waiting for firefighters to arrive.” He was also able to find two holy water fonts, that he emptied onto the fire. Over 800 churches were attacked across France over the last year. Please pray for the people in France. How Long is Easter? A Great 50 Days! - Q and A about #Easter and Pentecost to Share! "What you sow is not brought to life unless it dies. And what you sow is not the body that is to be, but a bare kernel of wheat, perhaps, or of some other kind;…So also is the resurrection of the dead. It is sown corruptible; it is raised incorruptible. It is sown dishonorable; it is raised glorious. It is sown weak; it is raised powerful. It is sown a natural body; it is raised a spiritual body. If there is a natural body, there is also a spiritual one. So, too, it is written, "The first man, Adam, became a living being," the last Adam a life-giving spirit. But the spiritual was not first; rather the natural and then the spiritual. The first man was from the earth, earthly; the second man, from heaven. As was the earthly one, so also are the earthly, and as is the heavenly one, so also are the heavenly. Just as we have borne the image of the earthly one, we shall also bear the image of the heavenly one (1 Cor 15:36-37, 42-49)..
Easter culminates in Pentecost, wherein the gift of the Spirit brings Christ's victory to the members of his Body, the Church.With the gift of the Spirit, we begin, already now, to share in Christ's rising from the dead.It is this faith which brings peace and hope to troubled hearts in a troubled world.The faith of Easter does not mean there will no longer be evils in this world, but rather that the evils of this world are no longer the final word.Suffering has not been removed, but filled with the presence of the Lord, who inspires hope, endurance and above all, love. 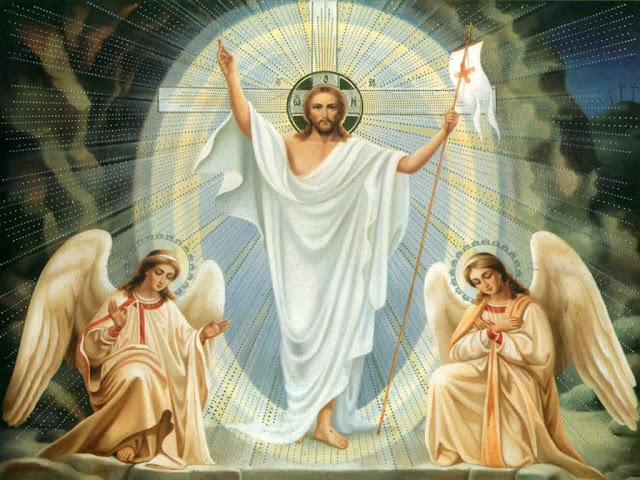 The octave of Easter comprises the eight days which stretch from the first to the second Sunday.It is a way of prolonging the joy of the initial day.In a sense, every day of the Octave is like a little Sunday. The word "Easter" comes from Old English, meaning simply the "East. "The sun which rises in the East, bringing light, warmth and hope, is a symbol for the Christian of the rising Christ, who is the true Light of the world.The Paschal Candle is a central symbol of this divine light, which is Christ.It is kept near the ambo throughout Easter Time, and lit for all liturgical celebrations. 22. 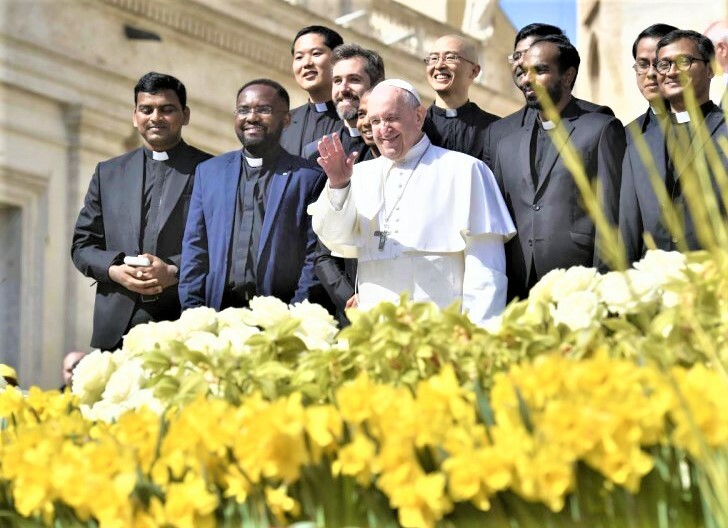 The fifty days from the Sunday of the Resurrection to Pentecost Sunday are celebrated in joy and exultation as one feast day, indeed as one "great Sunday." These are the days above all others in which the Alleluia is sung. 23. The Sundays of this time of year are considered to be Sundays of Easter and are called, after Easter Sunday itself, the Second, Third, Fourth, Fifth, Sixth, and Seventh Sundays of Easter. This sacred period of fifty days concludes with Pentecost Sunday. 24. The first eight days of Easter Time constitute the Octave of Easter and are celebrated as Solemnities of the Lord. 25. 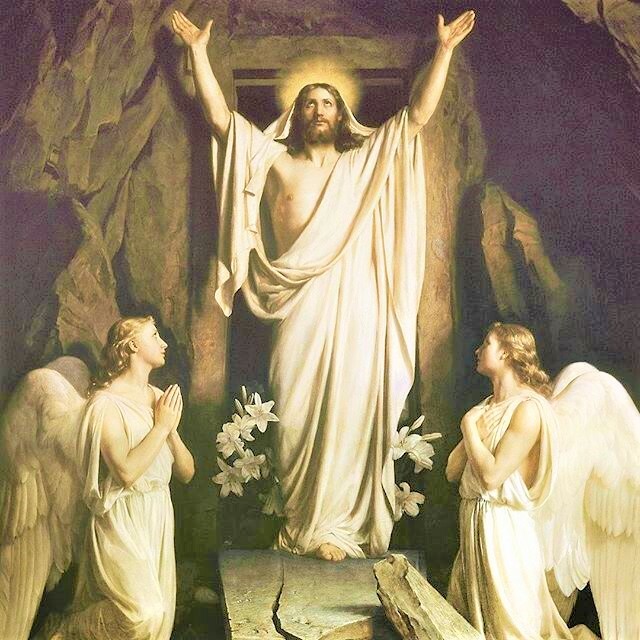 On the fortieth day after Easter the Ascension of the Lord is celebrated, except where, not being observed as a Holyday of Obligation, it has been assigned to the Seventh Sunday of Easter (cf. no. 7). 26. The weekdays from the Ascension up to and including the Saturday before Pentecost prepare for the coming of the Holy Spirit, the Paraclete. The liturgical color for Easter is white. The General Instruction of the Roman Missal(no. 346) also states: "On more solemn days, festive, that is, more precious, sacred vestments may be used even if not of the color of the day. The colors gold or silver may be worn on more solemn occasions in the Dioceses of the United States of America." Especially during Easter Time, instead of the customary Penitential Act, the blessing and sprinkling of water may take place as a reminder of Baptism. 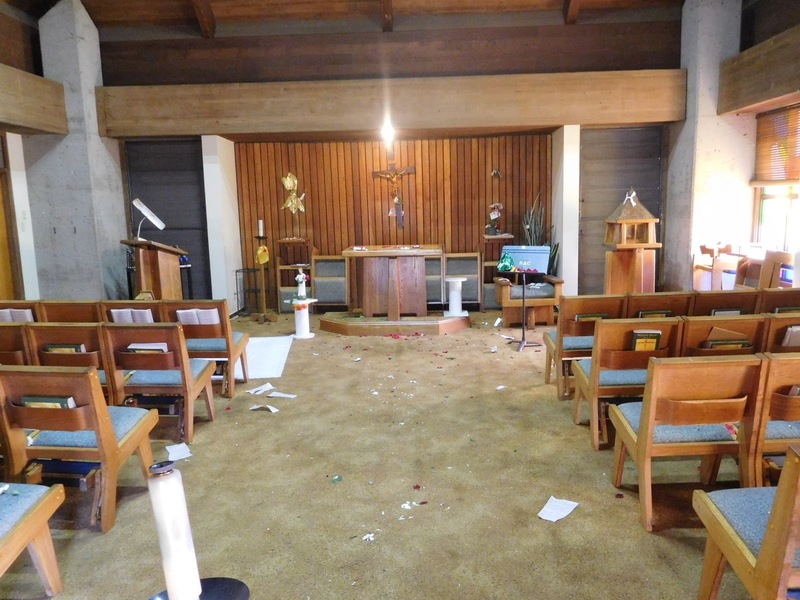 St. Anthony’s Catholic Church in Maui was vandalized after Easter. On Easter Monday women arriving at the Chapel of Saint Damien for morning mass discovered the damage. “When I entered the chapel, it was devastated,” he said. “We have a big picture of Our Lady of Guadalupe torn down. The relic of St. Anthony was covered, and the candles... everything was trashed.” He also explained that, "....the little infant Jesus, they cut off the fingers and the hand." The crucifix of the chapel was desecrated. “We had mass in the morning, but we didn’t have a 5 p.m. mass, and we usually close it after. So somehow we forgot to close the chapel,” said Bunda. Three weeks ago, a person also broke into the rectory at the church and vandalized other areas. Maui Police opened a burglary investigation. Father Bunda said he forgives the perpetrator and thinks it is still important to keep the chapel open to everyone. The high points of my day are my Mass, Divine Office and Rosary, when I spend time with Our Lord, opening my heart and mind to Him, listening, asking, thanking, adoring. This relationship with God is, I hope, the foundation of my every word and deed. Yet I won’t pretend prayer is always easy. Or the rest of the Christian life. Sometimes it’s hard to be a Catholic, to hear Jesus’ words to us today, to walk with Him on His road to Gethsemane, to join Him as He is tested by suffering and humbled in the fire of humiliation. Easter is confronting. The Cross tells the story of suffering humanity. The Tomb the story of all we have loved and lost. Still, we hope. From cross and tomb we dream of heaven. After a long Lent we cry out for Easter. After interminable darkness we crave the light. All these are works of Easter, of raising people up out of their tomb and gloom. All are professions of faith, in the human person made for greatness, and in the God who saves them. All are professions of hope, that ours can be a community of reverence and care. All are declarations of love, especially for the weak and powerless. Easter is for them all, and for each of us, as Christ raises us from our graves with Himself. By these works of mercy, more than our words, will people judge whether we are serious, whether we really believe in the resurrection, whether Easter is for us and for them. God bless you at Easter. and you will receive the gift of the Holy Spirit. and about three thousand persons were added that day. R.(5b) The earth is full of the goodness of the Lord. R. The earth is full of the goodness of the Lord. and preserve them in spite of famine. who is our help and our shield. who have put our hope in you. Mary Magdalene stayed outside the tomb weeping. where the Body of Jesus had been. but did not know it was Jesus. Jesus said to her, “Woman, why are you weeping? for I have not yet ascended to the Father. and then reported what he had told her.